This continues part one of on the ground reports from rank and file Solidarity members regarding their observations, experiences and impressions of the Occupy Together actions from around the country. Contributors in part two take a few different approaches to their reports, writing personal narratives, journalistic reflections and accounts about how OWS events have impacted their longstanding activism. Occupy Boston was first conceived on Tuesday September 27, and people moved into Dewey Square, across from South Station in Boston, that Friday. My family and I drove out from Western Massachusetts to join in for a weekend on Saturday, October 8. We’d heard about the effort from our housemate who had been to Boston to attend a march and rally put on by Right to the City, who held a congress in Boston that weekend. RTTC were a bit put off that the Occupy Boston crowd organized march without consulting and coordinating with the them, since they had planned their event months before and it was perceived as one big spin off of Occupy Wall Street. They felt torn about it, because they supported the occupy effort at the same time. From what I heard, they saw the group as young, inexperienced activists, who were simply unaware of the complexities involved in being good organizers. When we got there, a week after it began, the camp filled the entire square, with tents shoulder to shoulder, and only a few narrow lanes leading through them. There were at least 50 tents, possibly as many as 70. The group on Saturday night were probably more the central core of participants. The General Assembly at 7:00 was perhaps 50 people at its peak, youth in their early 20’s, 15-25% people of color, although it’s really hard to say. The GA spent little time on logistics, but was almost entirely focused on discussing various statements. The first was a preamble to a statement that a committee or committees are drafting. The second was a series of proposals against the wars in Afghanistan and Iraq, and in favor of an upcoming antiwar march. After much discussion the effort was blocked and the statements tabled. A concern was that these sounded like demands and there is a committee working on a list of demands. Another proposal did pass: a statement of solidarity with indigenous groups, pointing out that Boston is already occupied territory. Four women spoke of sexism in the group: language, men openly judging women’s appearance and inviting women to their tents. There was a lot of good discussion, but also a fair amount of defensiveness and tangents followed rather than acknowledging the issue. I found myself thinking that the discussions at the GA’s were exposing a lot of people to this type of process, and to some extent the dissemination and experimentation with the process was at least as important as the content. And while the process can be cumbersome, a lot of people participated, including a good gender representation and ethnic representation, suggesting that the process is comfortable and accessible for many people. The people’s mic seemed to help discussions in that it encourages people to get to the point. College students started organizing on Occupy Wall Street in Bloomington-Normal, attending various organizations’ meetings in town, during the weekend of Oct. 1-2. A few traveled to other demonstrations, one to Portland, Oregon and another student traveled to D.C.
Wednesday, October 5th, there was a rally and march of 200 students on the Illinois State campus, which is very large here and inspired the participants. Many of the people that came together to organize the protests have been attending each others’ events for months now, which we credit to the Wisconsin occupation and local networking this year. On Thursday, October 6th, the monthly anti-war protest was well over double its size, bolstered by the Occupy BloNo activity, and on Saturday, a number of people traveled to Chicago to attend the mass action against the war. On Sunday, October 9, late in the evening, there was a meeting of 35 people in Normal, near the campus, to discuss starting an occupation. It was attended by both students and workers, mostly younger with a few older people, majority white. There is a widespread desire to organize a more diverse occupation. The meeting established a week of actions, including the start of an occupation and future general assemblies. All these numbers sound small, but our impression in this town is that the energy is new and exciting. On Saturday, Oct. 8, more than 100 people from Occupy Long Beach marched along Ocean Boulevard to Magnolia Avenue to Lincoln Park, next to city hall. At Lincoln Park, residents told their stories with an open microphone. Marchers were multiethnic, many being students with a small sprinkling of unionists. Jennifer Klasing, a political science major at Cal State Long Beach, said before the march, “I’m concerned about my future. This is the first time my generation has stood up. I want to be a part of it.” Klasing came with five other students. Lakewood High School student Alyssa Mullenix, who identified herself as gender non-conforming, told the marchers that at her school the students have no computers, books, or the proper chemicals for their chemistry classes. She said at her school nine students have committed suicide because of LGBT harassment. Before the march, retired Longshoreman from ILWU Local 13, Louie Rodrequez, said, “The corporations are greedy. They are taking away people’s homes.” Rodgequez came to the march with two other longshoremen. Elizabeth Spidner, who has been a nurse for 12 years and is a member of SEIU Local 721, said, “I’m tired of the banks ripping me off. I’m worried about my kids future.” On Sunday, Oct. 9, at Bixby Park, another event is planned where residents again will have a chance to tell their stories. The GAs have had been 20 to 40 people each night. The people attending tend to be white and in their middle twenties; some are recent college graduates. While women were slightly less than half of the group, some of them are playing important leadership roles. No site has been chosen to occupy yet. Perhaps three times larger than last Sunday’s rally, about 450 people marched and demonstrated Sunday in Burlington, Vermont outside Citizens Bank. ‘Occupiers’ drew connections to local economic justice campaigns: University of Vermont workers struggling to win fair contracts while former UVM President Dan Fogel gets a $660,000 golden parachute; the Vermont Workers Center’s Put People First: Peoples Budget Campaign; the efforts of 11,000 Early Childhood Educators to win union rights and fair pay; and the efforts to stop Wisconsin-like budgetary slash and burn policies from taking root in the Statehouse and Burlington City Hall. The crowd was mostly under 30. 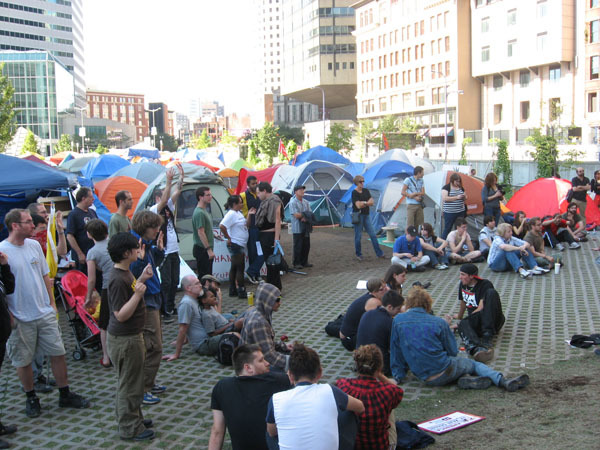 The Occupy Nashville “movement-in-formation” represents a potential sea change in activism here. A grouping of inter-generational politically-active people, accompanied by some academics, held the first General Assembly meeting last Sunday. Over 150 attended, stunning all those involved as most demonstrations fail to yield such a number in this political environment. The first rallies—one at Legislative Plaza on the 6th and another later the same day at the important Centennial Park—attracted between them well over 600 people, something quite uncommon for this area. Many of those involved expressed a qualitatively different level of commitment to the politics at hand. Many of those involved seem adamantly opposed to both major parties, something increasingly common as the state’s Democratic Party has effectively imploded on itself since 2008. Highlights of the actions included our contact with several union members—mostly the Teamsters—who saw the events early in the day on Television and then came to the later action in the park. Relationships were developed between union members and activists of various stripes. The involvement of the Workers’ Dignity Project—a low-income, Spanish speaking workers’ center—brought immigrant rights to the agenda at the event, as well as enormous support from the crowd for their recent efforts to combat wage theft in Nashville. A small group of 10 or so Ron Paul supporters and their Oath Keeper friend managed to convince around 100 people to march on the Federal building in town. Upon arrival they proceeded to denounce the Federal Reserve and the international Bilderberg conspiracy, much to the crowd’s surprise. The experience has led to a greater integration among the “informal leadership,” various radical elements and others, who have united to ensure a degree of collective discipline concerning messaging and democratically-sanctioned actions. Another General Assembly—with more community and labor participation as well as a united front of progressive and radical activists—is planned and we will have to see where things go from there. 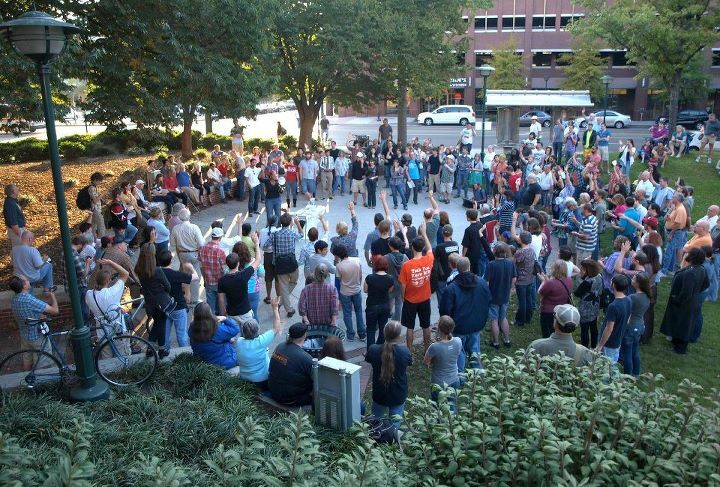 “Occupy Chattanooga” held its first General Assembly Friday (Oct. 6) in a park filled with about 200 people. The meeting was facilitated by a layer of organizers associated with a multi-issue social justice group called Chattanooga Organized for Action (COA), as well as UTC students and independents. The agenda started with a rousing “welcome” and explanation of ground rules. We then split into small groups (each group was about 20 people) where people collectively made lists of “demands” to prioritize. After that, each person in the small groups voted for two demands on their group list to prioritize over the others. Through this process, the group that I was in ended up with three issues with the most unity: nationalized health care (their phrasing, not mine), campaign finance reform (“get money out of politics” was the refrain all day), and quality public education. Each small group then delivered their top two or three demands to the general group. The whole process was supposed to let the best (or most unifying) points “rise to the top.” From there, we announced the formation of working groups (media, inclusivity/outreach, legal, demands, and action proposals). The “demands” group is tasked with crafting a proposal like the OWS “declaration” document, which will then guide local action and next steps. There were a few big omissions from the proposed list (like war, prisons, and immigration), but the process is not over and there will be room to modify whatever is proposed. The mood was good as we adjourned the meeting. The racial composition was heavily white (90%) in a city that is 36% Black. Some of the organizers actually do have roots in the city’s more diverse neighborhoods, but that hasn’t translated into the involvement of that base in the “Occupy” project. That said, I think there’s great potential and room to grow in size and quality. I’m looking forward to the next meeting and collectively deciding a course of action! Someone (I still don’t know who) made a Facebook group for “Occupy North Georgia”–in the span of a week, over 1,000 people joined. People used the discussion group to plan an initial meeting and this was held in Dalton, GA (my hometown and present location, right near the GA-TN state line, pop. ~60,000). About 25 people came to the meeting. The facilitator guided folks toward making a short statement of common “values” that a working group would refine and propose at the next meeting. I was encouraged by the lack of right-wing libertarian points, though one woman did come with a sign that read “End the Fed” (it went unmentioned). Most participants identified as Democrats but were eager to be a part of a “non-partisan” group. All attendees were white, except for one African-American man. We spent most of the two-hour meeting discussing local economic issues and, to much a lesser degree, immigration policy. Dalton, GA is a global center of textile production (for real, y’all), but factory closures over the past three years have sent the official unemployment rate to about 12.6%, if I recall correctly, which is the highest in Georgia and perhaps the Southeast. This crisis is compounded in the Latino community (about half the population of Dalton) by the recent passage of HB 87, our Arizona anti-immigrant copycat legislation. Undocumented folks and their family members are leaving the city, afraid of the police roadblocks that seem to have popped up everywhere they live and work since HB 87 went into affect. Of course, this has not improved the economic standing of whites one iota. Meeting attendees understood that immigration had to have a place in our values platform. Likewise, people understood that we couldn’t use the “99%” rhetoric until our group was half Latino. Since the meeting, some of us have already been talking with a local immigrants’ rights group and we are looking forward to common work–this is a very encouraging development not just for the group but for the city. Also encouraging is simply the fact that this happened in city with no “left wing” organizations. The “Occupy Together” moment yielded what might be a critical opportunity to kick start an independent, anti-corporate project in this small city—and I trust this is the case with many of the other hundreds of cities with populations under 100,000 which held meetings. Addendum: Since the meeting, it’s been announced that a local plant is closing and laying off 270 workers. It’s owned by Warren Buffett, who would prefer not to be thought of as “the 1%,” but he most definitely is…and there might just be a new group in town to remind him.